The world famous annual boat race between Oxford and Cambridge took place yesterday. Thames Rockets have been providing vessels for the elite boat race for the past ten years, following the competing boats closely behind along the entire 4.2 mile course. It really is one of the most exciting events on the river and we love waving to the thousands of supporters and fans lining the river! Official sponsors of the Oxford and Cambridge boat race were on board Thames Rockets spectating the race and cheering the athletes on from our London speedboats. A huge congratulations to everyone on the Cambridge team for winning both the men’s and women’s boat race this weekend! Cambridge men’s team won by an amazing time of 16:57 with the women’s team finishing five lengths clear of Oxford in 18:47. This year our highlight was James Cracknell’s amazing achievement – at 46 years old becoming the oldest person ever to compete in the boat race. After the race had come to a finish James spoke to BBC Sports (did you spot Thames Rockets floating around in the background?!) where he said, “I missed the sport and surprisingly I did not regret my decision to do this at any point of the race.” This fantastic achievement was amazing to witness and a very proud moment for James and the whole of the Cambridge team. So now for the stats! Cambridge have now won a total of 84 races, compared to Oxford just shy with 80 races won. Yesterday was the first time Cambridge have achieved back-to-back victories since 1999. Thames Rockets are extremely proud to be a part of this spectacular event. As always it was a great day and was enjoyed by many both on the river and across the world. Did you spot us on the river? If so post your pictures on social media and tag us @ThamesRockets! We love to see all your great snaps! 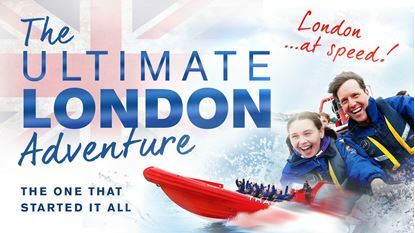 Or if you watched the boat race and now want to experience seeing the sights of London along the river on a Thames speedboat then why not book to come on board our award winning trip ‘The Ultimate London Adventure’? Book your tickets on board our speedboats here.